On a recent visit to Switzerland, I unexpectedly crossed the border one day for lunch in Italy. Choosing a traditional Caprese salad with Foccacia bread and Gnocchi Gorgonzola seemed the right thing to do. And it was. What a meal! 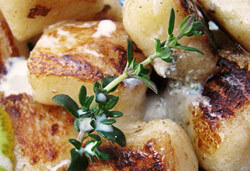 5) On service pan sear the gnocchi in butter. 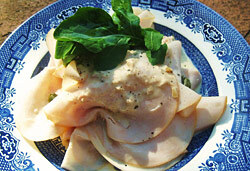 Serve with gorgonzola cream sauce and a fresh lemon segment. 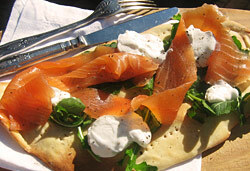 I hope you enjoy some of my latest ideas starting with a crispy, hot pizza topped with room-temperature smoked salmon, creamy cream cheese, freshly-picked, slightly-peppery rocket and a drizzle of lemon olive oil. 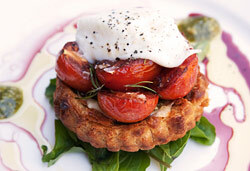 A perfect light lunch option filled with exciting textures. My interpretation of "Vitello Tonnato" (Roasted veal (vitello) thinly sliced with a sauce of pureed tuna (tonno), anchovy, capers, lemon and olive oil). I viewed this as a new-age, tuna mayonnaise and couldn't wait to get home to try out my version. 1) Liquidize 125 g of the beetroot with 1 litre water or 1 litre good quality vegetable stock. Put into a pot and allow to come to the boil. 1) Get a heavy based pot hot. Add butter and olive oil. Then add onion and garlic and sauté well. 2) Add rice and stir to allow each grain to be coating with the oil. 5) At this stage you could always cook it fully or ¾ of the way and then complete cooking on service by reheating and adding the last of the hot liquid. Either way is fine but must result in a slightly textured, creamy risotto. Not stodgy or dense. 6) Serve with the leftover (brunoise: finely chop) beetroot, beetroot sprouts, crumbled Gorgonzola and a fresh fig sliced in half.